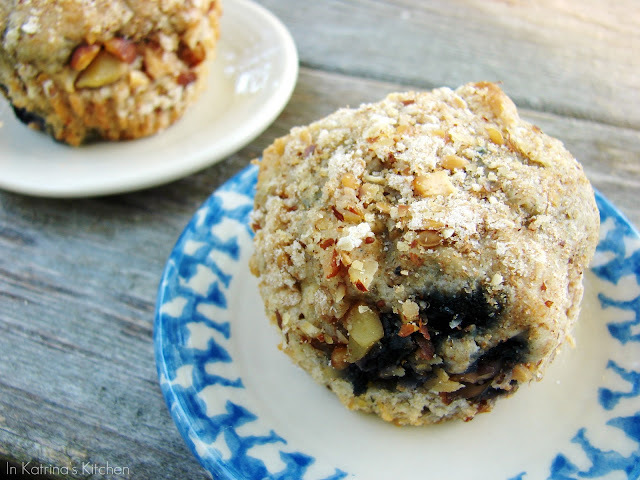 This recipe for healthy yogurt Blueberry Energy Muffins are filling and delicious. Make them on the weekend and enjoy them all week! I made you muffins. Well actually I didn’t make you anything but my friend Rachel did. She came over and brought blueberry muffins to share; aren’t we lucky? She is one of those inspiring people who make you want to be a better you. She has transformed her life and her family. I’m so happy to know her. I had the privilege of munching on a few of these muffins and I can tell you that they do not disappoint. Add flours, oats, sugar, baking powder, baking soda, and salt in the bowl of your mixer. Combine and make a well in center. In a separate bowl combine yogurt, milk, oil, vanilla, and egg, stirring with a whisk. Add yogurt mixture to flour mixture; mix just until moist. Fold in blueberries. Spoon 2 rounded tablespoons of batter into each of 30 muffin cups coated with cooking spray. Combine 1/4 c. flour, almonds, brown sugar, and butter. Sprinkle evenly over batter. Bake at 400 degrees for 15 min or until muffins spring back when touched lightly in center. Cool in pans 10 min on a wire rack. Remove from pans and serve! Optional: add 1/4 cup flax seed, a dash of cinnamon, & wheat germ to the muffin mix. Substitute frozen blueberries for fresh - be sure to drain excess juice. I love blueberry muffins and I love the added yogurt to these. They look perfectly moist too! Your friend Rachel is awesome! MMmmmm, I love blueberry muffins! Can you send one my way so I can have it for breakfast tomorrow?! 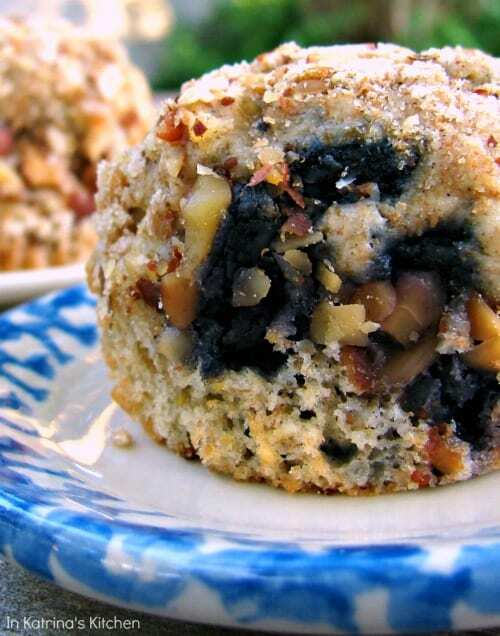 What a great healthy blueberry muffin! 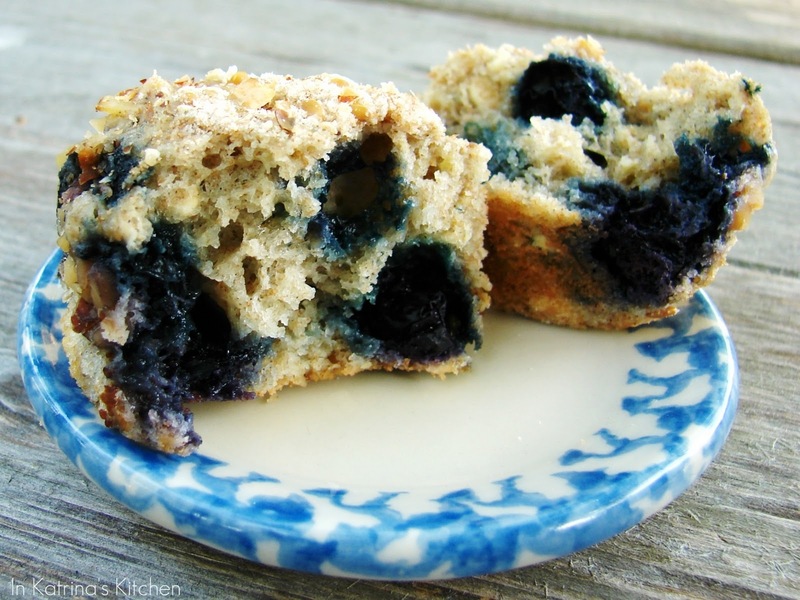 The blueberries in those muffins must have been huge…. they look like they exploded with juiciness in those photos. Rachel and Katrina, thank you so much for sharing these wonderful energy muffins. They look fabulous – and have certainly given us a boost! those are so puffy and so good looking! I love streusel toppings! Love that you used whole wheat, oatmeal and yogurt! I just happened upon your blog. Love it!!! I think these are the perfect mix of summer and winter – blueberries for the summer and lots of oaty goodness for winter! My husband would totally love them. Mmm warm muffins are great. And even better that these are good for you! They look great. Lucky you having such a friend! Yes, please!! I need all the energy I can get. Does that mean I'm getting old?? Or maybe it's the kids running me all over the county! Love all the ingredients you have here… this is SO my type of muffin! I love this recipe! Thank you and thank Rachel. 🙂 Much as I say muffins are just cupcakes disguising themselves as breakfast food…I do appreciate it when I can find a muffin recipe that has healthy, energy-boosting ingredients! These look great. Ok, these look absolutely INCREDIBLE! Aren't great friends just wonderful? Soo glad you have one! What great muffins – so full with great stuff! Your friend Rachel is a keeper! I could use one of these about now, it's been a rough week. Rachel is a great friend to have, looks like she is looking out for everyones health. I've been a little bad myself and need to quit that. Hope you have a great weekend. Mmmm. those are really bursting with blueberry goodness! I love this take on blueberry muffins 🙂 I would definitely make extra for the freezer. I feel like I've conquered the world when I pull one out in a pinch! I am always looking for new muffin recipes! those muffins look so very very good! and there healthy, what a great recipe, and I could certainly use some energy, so please send over a few, don't worry about the milk, that I have! Those things look packed! What awesome muffins! I want friends that bring me food – lol, they all just think since I cook, I'll bring the food. Your friend Rachael sounds like an amazing person to know. I cherish people like that. Yum, these are gorgeous, I love the "healthier" options on muffins! Ummmm, Wooo, Wow…Should be called a Blueberry Bomb! Delicious! Great healthy muffins. They look spectacular! Wow these muffins look amazing and filled with so much good stuff! My husband is a BIG fan of blueberry anything. I will have to try these! Wow! Those muffins look amazing!!! Rachel's muffins sound great. I love all those big chunks of blueberries! Those look way too delsih to be healthy! Beautiful photos Katrina and great post! Wow are these the best darn blueberry muffins I have ever seen! Bookmarked! Yum! But what is the calorie count for the blueberry muffins? Energy is good, but what about calories? Thanks! Hi Connie, I do not track calories. There are a lot of online tools and apps *(like My Fitness Pal) that allow you to do so if you need that information. Thanks for writing! I can’t wait to try these! I need energy and I love blueberries! !